The Insurance Act 2015 ('the Act') is the first comprehensive statutory reform of the insurance law of the United Kingdom since the Marine Insurance Act 1906. It introduces thorough and, in some cases, fairly drastic reform of some of the core tenets of UK insurance law, including: the insured’s pre-contractual duty to the insurer, and remedies for its breach; the knowledge of the insured and the insurer for the purposes of the pre-contractual duty; the effect of insurance warranties and other terms tending to reduce the risk of loss; fraudulent claims; and damages for failure to pay an insurance claim in a reasonable time. This book is a thorough introduction to the Act. 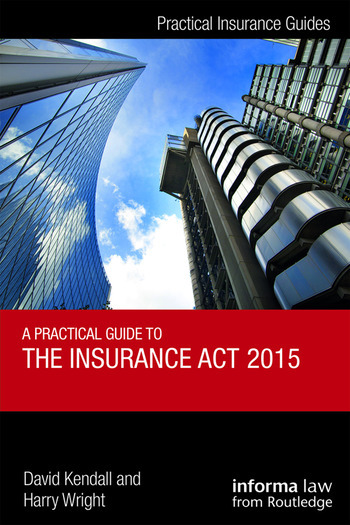 It focuses primarily on the impact of the Act on English law as applied to non-consumer insurance and reinsurance. Of assistance not only to insurance lawyers and members of the judiciary, but also underwriters, claims handlers, brokers and buyers of non-consumer insurance policies, this book covers each of the core changes brought about by the Act. It also analyses the particular ways in which the Act differs from existing law, by reference to the Marine Insurance Act 1906, and cases decided under the old law. David Kendall is a partner at Cooley LLP. He is a former Chairman of the British Insurance Law Association and Visiting Professor in the Centre for Commercial Law Studies, Queen Mary University of London. Harry Wright is a barrister at 7 King’s Bench Walk. "The co-authors have written a compact and pithy account of the Insurance Act 2015, its emergence and impact on UK law , which is accurate, rich in analytical scrutiny, and presented with commendable clarity. …topics are expounded by the authors with skill and incisiveness, and in a manner which reveals their familiarity with the subject area. Of its kind this is a remarkably good and useful book. Anyone who wishes to be guided sagely and assuredly through the process which launched reforms embodied in the Insurance Act 2015 could do no better than study and digest the contents of this book."